Toronto is a city known for its diverse neighbourhoods and some of the most interesting and eclectic are located in the East End! On this tour we will walk, eat and drink our way through The East Danforth, The Gerrard India Bazaar (aka Little India) and Leslieville. These three neighbourhoods all offer different experiences and have some very interesting histories that we will delve into as we go. 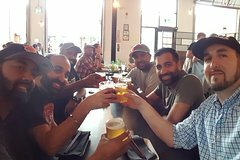 The Toronto craft beer scene is booming and we will stop at a number of popular breweries and bars that pride themselves on their beer selections. We will also take part in Toronto's amazing multicultural food scene by stopping and snacking at a few local restaurants along the way. • 3.5 hour walking tour through some of Toronto's most interesting neighbourhoods, highlighting some of the many local craft breweries in the area. • 4 beers from 4 different bars or breweries included on the tour. • 3 snacks highlighting Toronto's diverse food scene. • Explore The East Danforth, a pocket of the city just east of Greektown known for its diverse selection of shops, bars and restaurants representing cultures from all over the world. • See the Gerrard India Bazaar, the historical heart of Toronto's South Asian community. • Visit Leslieville, one of the trendiest neighbourhoods in the city. • Learn about the food, drinks and neighbourhoods from an experienced local guide. • We will be supporting local businesses as all tasting costs as well as gratuities for restaurant staff are included in your ticket price. • Small group tour limited to 8 people to ensure a more personalized experience.